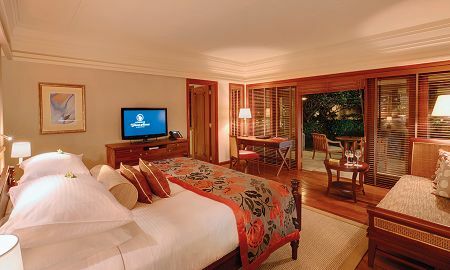 Set on the unspoilt East Coast beach, facing the ocean, all Junior Suites Beachfront luxuriously furnished ooze comfort. 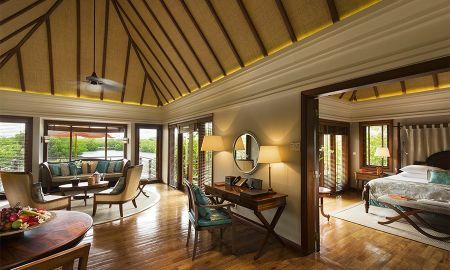 The thatch roof and the furnished terrace which reflects the local warmth complement the décor. Each Junior Suite Beachfront measuring 70m2 offers: air conditioning, bathroom with bathtub, double vanities, seperate shower/WC, hair dryer, minibar, 24 hour room service, choice of pillows on arrival from a special menu, complimentary tea/coffee making facilities, safe, desk, satellite TV, Hi-fi, telephone, Apple Mac Mini, complimentary wireless internet access, furnished terrace or balcony. 2 Adults + 1 child or 1 adult + 2 children under 12yrs old. 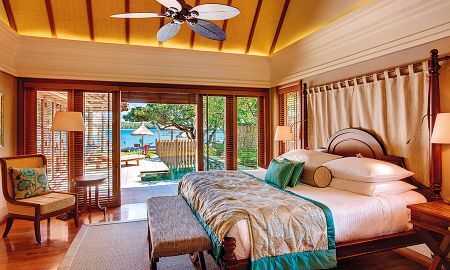 Warm and luxurious, all junior Suites are elegantly decorated in spice tones with a pinch of Mauritian warmth which exudes from the ecological thatch roofing to the welcoming flooring instilling a holiday mood instantly. Each Junior Suite measuring (70m2) offers; Bathroom with bathtube, Double vanities, seperate shower/wc, Hairdryer, Minibar, 24/h room service, choice of pillows on arrival from our special pillow menu, complimentary tea/coffea making facilities, Safe, Desk, Satellite TV, Hi-fi, Telephone, Apple Mac mini, complimentary wireless internet access, furnished terrace or balcony. Direct access to the beach, beautiful ocean view at a prime location on the east coast of Mauritius, all beach villas offer everything you need for a perfect blue sky holiday. Each Beach villa measuring 130 m2 offers a separate living room with dining/seeating area, Guest Shower/WC, Heated Pool, Air-Conditioning, Bathroom with, Whirlpool bathtub, Double vanities, Separate shower/WC, Hair Dryer, Minibar, Safe, desk, Satellite TV, Hi-Fi, Telephone, Apple Mac Mini, Complimentary wireless internet access, Furnished terrace or balcony, 24 hour room service, choice of pillows on arrival from a special pillow menu, complimentary tea/coffee making facilities, Nespresso machines, iPod dock station. Constance Prince Maurice is an exceptional luxury hotel set amid lush tropical greenery. Combining style, space and unique architectural design, the hotel promises you an accomplishment of all your desires. Peaceful the day and picturesque at night, it invites you to live an exotic and relaxing stay. The warm lights give the structure a harmony with its environment. Inspired by the principles of Feng Shui, the suites create a feeling of perfect harmony. 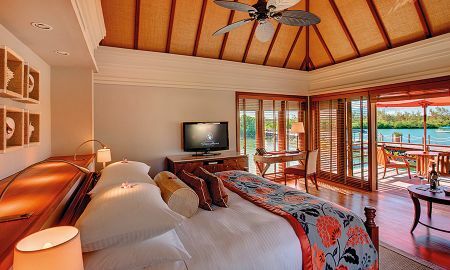 Each suite has a terrace on stilts offering a breathtaking view of the nature reserve. Families can opt for the Beach Villas and enjoy the complimentary children's club. When it comes to dining, the Archipel Restaurant invites you to savor refined dishes with Mauritian touches in an elegant setting with a splendid view on the beach or the infinity pool of the hotel. You can accompany your dishes with a succulent wine from the luxury cellar of the hotel. The U Spa by Constance invites you to relax and regain balance between your body and soul. You can also enjoy a walk that will lead you to absolute well-being. Scuba diving and snorkeling are available to explore the wide variety of marine creatures. Golfers can also be entertained in one of the two 18-hole championship golf courses. Ideally located in a real paradise, the Hotel Constance Prince Maurice is 5 km from Bras d'Eau Public Beach and 8 km from the Water Leisure Park. Sir Seewoosagur Ramgoolam International Airport and Port-Louis are less than a one-hour drive away. For flexible rates, 50% of the total amount may be charged by the hotel anytime after the booking. The Honeymoon rate is only valid for persons whose travel dates are within 6 months of the wedding date. A copy of the wedding certificate should be provided upon check-in. Children up to 6 years stay free of charge sharing parents bed. Children between 7 - 12 years pay EUR 110 per day on Bed and Breakfast and EUR 145 per day on Half Board.